Here at work, we use a Lanier Multi-Function Printer/Scanner/Fax/Toaster the size of a small car that does tons of things and does them pretty well. 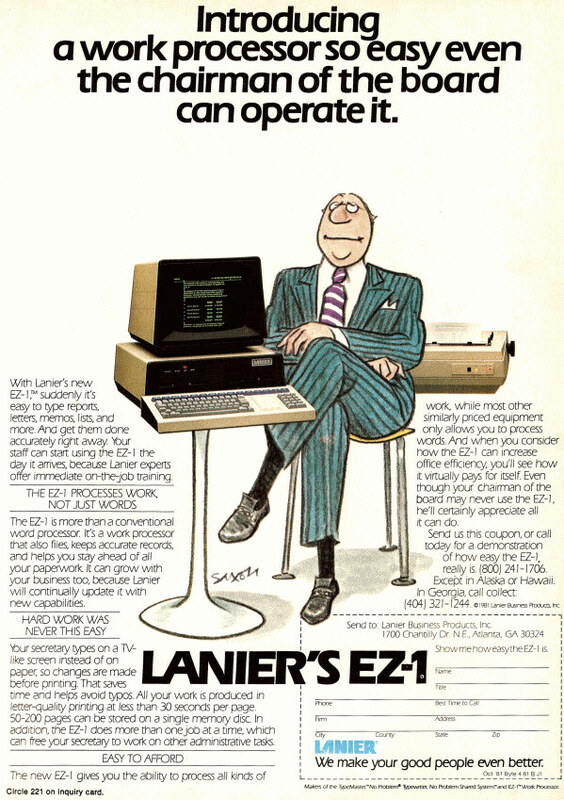 However, back in 1981, Lanier was in the business of selling systems, and if you think that their EZ-1 was simply a word processor, you'd best think again. Billed as being the Work Processor, even the most smugly drawn board chairman in Toon Town could handle it. Through the magic of its TV-like screen it can be used to generate literally several dozen pages that can be stored on a SINGLE disc. Paired with its dot matrix hover-printer, it could print output at a blazing 30 seconds per page. Franklin Covey would definitely consider the EZ-1 to be a "Win-Win". 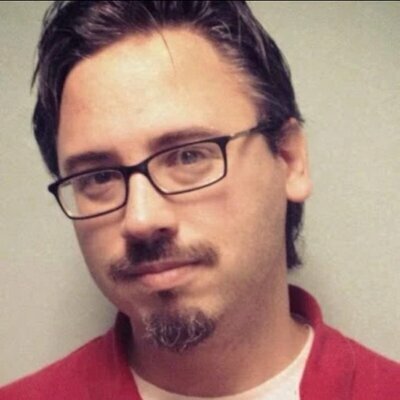 See this guy? Good - Remember his face. 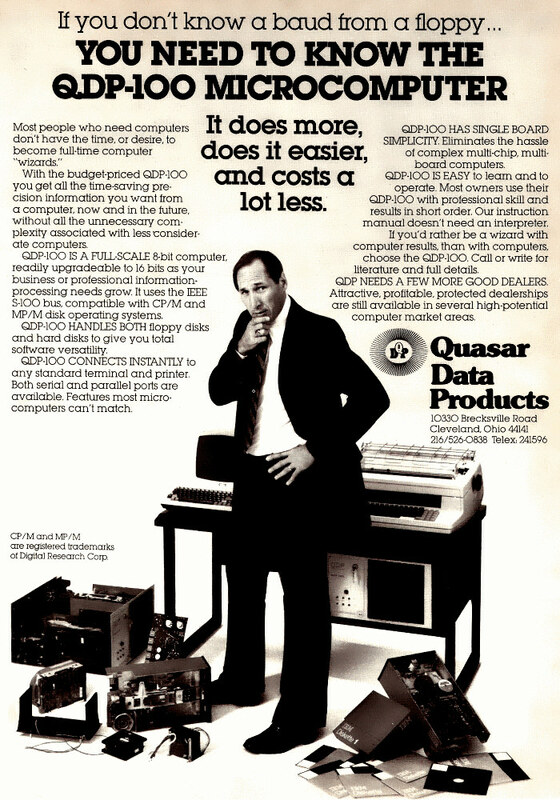 He's the reason why you're going to switch to Quasar Data Products' budget-priced QDP-100. The poor IBM in pieces at his feet? Yeah, that's his latest victim. When you switch over to the versatile QDP-100 with its simplicity and FULL-SCALE 8-bit computing power, you're joining a FAMILY, capuche? The VP of Finance, being the helpful guy that he is, showed up to help with the data center move. He ended up dropping the company's payroll server and is contemplating who in the server group he can pin the blame on for this. A jerk like this should never be allowed to touch a computer or anything electronic. Ever. When you're considering your next IT purchase, don't be stupid – buy the QDP-100 – it's the one built into a freakin' desk. 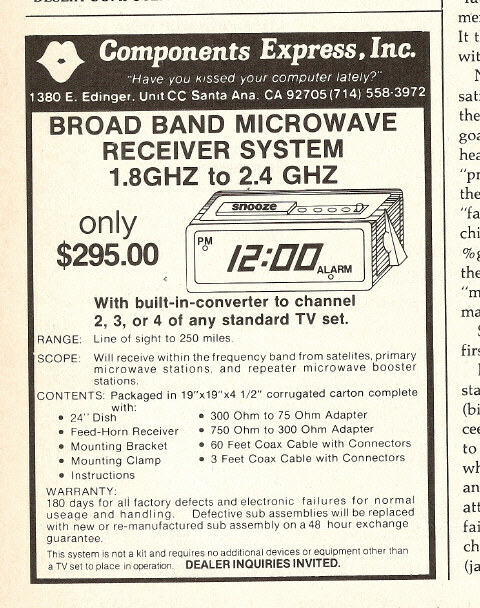 They're selling a satellite "something" to do with a TV, but is that...an alarm clock?